DENVER – It won’t be only women and men, but also transgender, non-binary and genderqueer persons who will march Saturday to “listen to those who have been silenced, unite under the banner of anti-oppression and act with intention” during the third annual Womxn’s March Denver at Civic Center Park. The march, which started in 2017 following the inauguration of President Donald Trump a day prior, started with the goal of sending a bold message to the new administration. This year, however, Colorado’s chapter has opted for a more inclusive message: intersectionality. 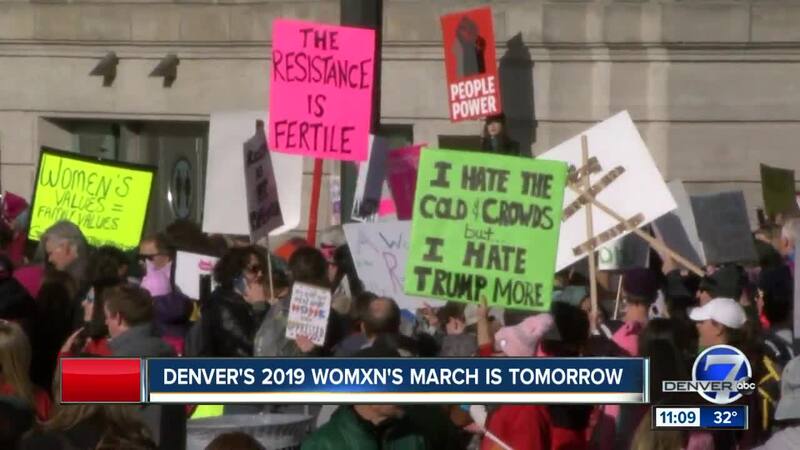 Nearly 6,000 people have said they’re going to march on Saturday in Denver, which is scheduled to start at 9 a.m. Twenty-six thousand others have shown interest in the rally. Demonstrators will begin congregating in Civic Center Park for a pre-rally before the main event. That pre-rally is expected to start at 9 a.m. at the Civic Center Park Amphitheater. The march will start in front of the Denver City and County Building (Bannock Street) and go south toward West 14th Avenue. It will then turn east onto West 13th Avenue until it reaches Lincoln Street. Once at Lincoln, it will turn north until it reaches East 14th Avenue. At that point, it will go east on 14th until it reaches Grant Street. Once on Grant Street, protesters will then head to Colfax and then turn west until it reaches Civic Center Park. Organizers say there will be volunteers on every corner of the route for anyone needing assistance during the march. And yes, your well-behaved family dog (on a leash) is also welcome to attend. Organizers said they would do their best to accommodate people “of all abilities” and will have reserved seating for those who cannot march but would like to support the cause that day. RTD is increasing bus and light service during this year’s event and there will be a temporary detour until about 1 p.m. for buses that travel through downtown Denver. Officials said extra cars will be added on the D and H lines to increase capacity during the march. Buses affected by the Womxn’s March are the 0, 6, 9, 10, 15, 15L, 16, 52, and the 83D/83L routes. RTD officials said you should expect some detours from these buses as well as minor delays. If you’re in Boulder and want to participate in the Denver march, the YWCA Boulder County will be providing buses to those wishing to make the trip. They will leave Boulder at 7:30 a.m. and return from Denver in two shifts: one immediately after the march at 12:30 p.m. and another after the post-march rally at 1:30 p.m.
Lyft will also be providing rides to the march. Use code WOMXNSMARCH19 for 20 percent off one ride to or from Civic Center Park. After the Women’s March was criticized for promoting “white feminism,” organizers of this year’s march are switching the focus on marginalized groups to include transgender, non-binary and genderqueer people. Some of the speakers at this year’s event are Adri Norris (Center for Colorado Women’s History), Ashley Panelli (9to5 Colorado), Lisa Calderón (Colorado Latino Forum), Maralee McLean (Moms Fight Back), among others. To view a full list of speakers and artists participating during the rallies, click here . This local movement isn't only taking place in the capital. Sister marches across Colorado are taking place in 18 different other cities including: Alamosa, Aspen, Boulder, Broomfield, Colorado Springs, Cortez, Crested Butte, Durango, Grand Junction, Greeley, Gunnison, Longmont, Montrose, Pueblo, Steamboat Springs, Telluride, Trinidad, and Vail. If you live in or near any of these cities and would like to participate in your local march, find more information about each one of these events here . Besides the U.S. (including Hawaii), marches are also being planned in Costa Rica, Bermuda, Canada, France, Italy, Germany, Austria, and Japan.